Her look mixes youthful fun with androgyny and bold colors. 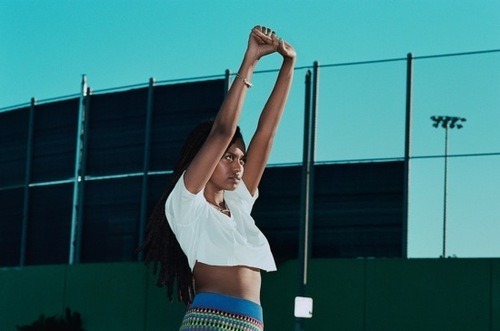 Kelela’s style has the playfulness of a teenager on Santa Monica Pier mixed with unafraid high fashion. We found three pieces that channel Kelela pretty well, we think. This geometric crop top paired with soft cotton trousers or denim cutoffs would be delightful. A fellow stockist on Madesmith, Mor Elian of Myrrh is a Los Angeles resident who makes jewelry and DJ’s. Her pieces are right up Kelela’s alley. Madewell’s the queen of year-round staples, and these neon blue shorts are a great summer take. They have a little length for comfort, and you can snap ‘em up for the sale price of $34.99.